Viridian X5L Green Laser Light Combo is one of the best lasers/light combo units on the market. The Viridian X5L Green Laser Light Combo features a 240 lumens light with strobe capability along with a green laser 100x brighter than a standard red laser. The Viridian X5L Green Laser Light Combo with pressure switch has a pressure sensitive switch located inside a thin plastic cover which can be mounted onto the grip of any rifle. When pressure is applied to the switch, it triggers the Green Laser, Light, or a combination of the two to turn on. When you release pressure, the Viridian X5L Green Laser Light Combo turns off. This feature is perfect for operators that do not want to give away their position until they decide to squeeze and turn on the Viridian X5L Green Laser Light Combo. This unit will fit any full-size standard handgun lower Picatinny rail like the lower rail on the FN Five-seveN Pistol and FNX 45 Tactical. The unit fits perfectly on both of these pistols and actually looks like it was designed for these two firearms. This Laser light combo is one of the best in its class, with every feature you could want and a combination of laser/light options including strobe modes. The ERC Instant on feature which is included with the Viridian Green Laser allows you to automatically turn on and off the laser or light using a TACLOC holster. 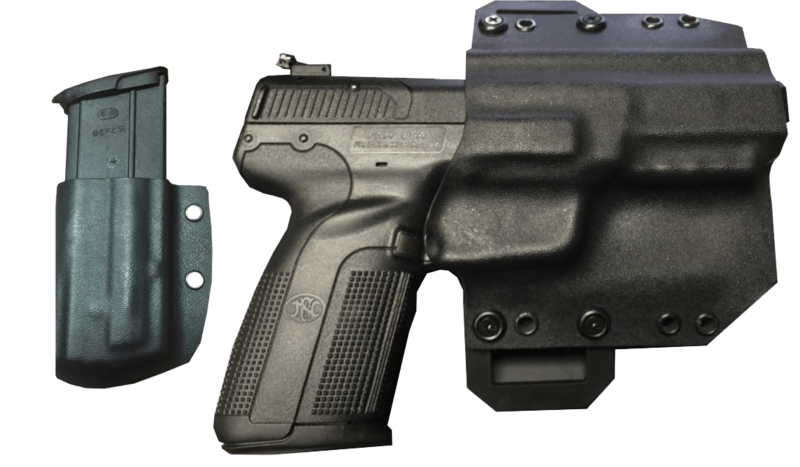 The holster which we custom make has the magnet built inside the holster which triggers the ERC feature to turn on or off. You can set the laser, light or a combination of the two to automatically turn on when drawing from your TACLOC holster. Because of the limited selection of holsters for FN Firearms, ask or add a custom ERC Enabled hand made custom holster while checking out by visiting our holster shop or add one when selecting the upgrades for the firearms before checking out. Add Holster that accommodates X5L with instant on/off? Add Mag Pouch for opposite side?